The tea leaf salad has earned icon status for very good reason. Texturally exciting, bold, and undeniably unique are attractive qualities. The rainbow salad, or let thohk sohn, is also a popular dish in the Burmese repertoire. 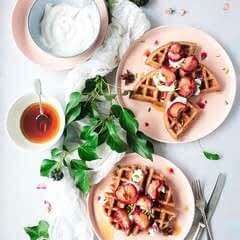 Artfully composed, with a multitude of distinct and harmonious ingredients, it rivals the tea leaf salad, many people might say. NOTE: Indigenous to Africa, tamarind is a sour fruit that grows in large, clustered brown pods on the tamarind tree. Its most familiar use is in pad thai preparation. Although the flavor of tamarind is unique, 2 tablespoons of fresh lime juice may be substituted. 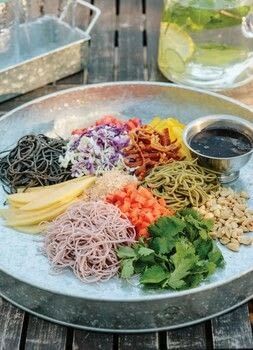 For the noodles, I recommend using two to three different varieties such as brown rice noodles, black rice noodles, and green tea noodles. Posted by Ulysses Press • Published 19th October 2016 • See Ulysses Press's 78 projects » © 2019 Elizabeth Howes / Ulysses Press · Reproduced with permission. In a medium saucepan over medium-high heat, warm the grapeseed oil until just bubbling. Add the wonton strips, and fry until golden brown, about 2 to 3 minutes, stirring occasionally. Remove from the oil, season with salt, and allow to drain on paper towels. To make the vinaigrette, whisk together the tamarind paste, chickpea flour, fish sauce, and maple syrup in a medium bowl. Slowly stream in the garlic oil until emulsified, and season with salt and pepper. Transfer to a glass jar, and refrigerate for up to a week. Cook the noodles separately, drain, and rinse with cold water. Set aside until ready to assemble the salad. Toss the crispy garlic, noodles, papaya, tomato, carrot, cabbages, bell pepper, cilantro, and peanuts, along with the dried shrimp and black garlic, if using, with the desired amount of vinaigrette in a large serving bowl. Season with salt and pepper, and garnish with extra cilantro before serving. A quintessential pantry staple in Burmese cuisine, chickpea flour, also known as gram or besan flour, is a gluten-free, protein-dense ingredient. When slowly toasted in a heavy cast-iron skillet, it morphs into a unique condiment that adds irrefutable texture and depth of flavor. Most Asian grocers, health food stores, and specialty food stores carry chickpea flour. Place a cast-iron or other heavy skillet over medium- high heat. Add the flour, and use a wooden spoon to stir occasionally until the flour begins to turn a light golden color. Lower the heat to medium, and continue to stir, exposing all the flour to the hot surface for an even toast. After about 10 minutes, remove from the heat, continuing to stir occasionally until the skillet cools. You’ll know the flour is properly toasted when it reaches a golden color and is aromatic. Transfer to a large plate, spreading out the flour to cool completely. Store in a glass jar at room temperature for up to a month. In my opinion, this duo is a must for the tea leaf salad. Leaving some of the garlic slices intact while finely chopping others makes for an interesting texture. In a medium saucepan over medium-high heat, warm the oil until it begins to shimmer. Toss one garlic slice in. Once the garlic begins to sizzle, add the remainder, and allow the oil to come back to almost boiling. Reduce the heat to medium, shaking the pan occasionally to evenly crisp the garlic. After 2 to 3 minutes, a light golden color will begin to develop. Once all the slices are uniformly golden, remove them with a slotted spoon, and drain on a paper towel–lined plate. Season with sea salt. Once cool, finely dice some of the slices, if desired. For the garlic oil, allow it to cool, then pass it through a fine-mesh strainer into a glass jar. If stored in a cool, dark spot, the oil will be good for a couple of weeks. My little boy carries a small mason jar of these peanuts around with him sometimes. They’re a humble and satisfying way to incorporate texture and roasted flavor in many recipes. To him, at least, they’re also the perfect snack. Place a cast-iron or other heavy skillet over medium heat, and add the peanuts. Stir them often with a wooden spoon to prevent burning. The end result should be an amber color that occurs gradually, after about 4 to 5 minutes. Once that is achieved, turn off the heat, stirring occasionally for another minute. Transfer to a large plate, spreading the peanuts out to cool. Once they’re cool, chop by hand or pulse in a food processor until you have some coarsely chopped pieces along with some powder. Transfer to a glass jar, and store in the refrigerator for up to a month. Not entirely mainstream yet, the antioxidant-rich fermented black garlic brings on a complex sweet-sour flavor (reminiscent of molasses, balsamic vinegar, tamarind, or dried prunes) and a soft, chewy texture known for providing significant free- radical protection in the body. Wrap garlic heads in plastic wrap to trap the humidity and keep the garlic moist. Next, wrap the heads in several layers of aluminum foil. Place in a dehydrator, at 130°F, and let sit until the heads are black and soft, about three weeks. You can also use a rice warmer or slow cooker, placed on the warm or low setting for about two weeks. Store in an airtight container, in the refrigerator, for up to six months. To use, peel the cloves and gently press out the garlic. Black garlic can also be purchased at some specialty markets and online at www.blackgarliccity.com.